Aside from creating email content that is new and engaging to your audience, it's also important to know when it's best to target a message to your entire list and when to send to certain segments. It is also important to know when it's best to stop sending to certain addresses altogether, even if those addresses haven't unsubscribed on their own. Here are a couple of tips you can use to help maintain the good health and status of your email list with email clients. You may choose to only send to addresses that have opened your messages in the past year. Email clients will begin to place messages in the Spam folder if the user constantly doesn't open any messages, or place messages from your sending address to all users in the Spam folder if a large percentage of your recipients don't engage. The addresses that have not opened in more than a year can be targeted with other themed emails such as "We miss you," or, "Check out what's new at…" messages. An important thing to keep in mind is that you don't want your list to get to the point where a large percentage is in the 1 year non-openers/clickers category. Keep things fresh and new, and maybe even check in on your 6 month and 3 month non-openers/clickers with targeted messages. Besides targeting your list for non-active addresses, you can also target your active users based on any information and interests they have agreed to provide you. 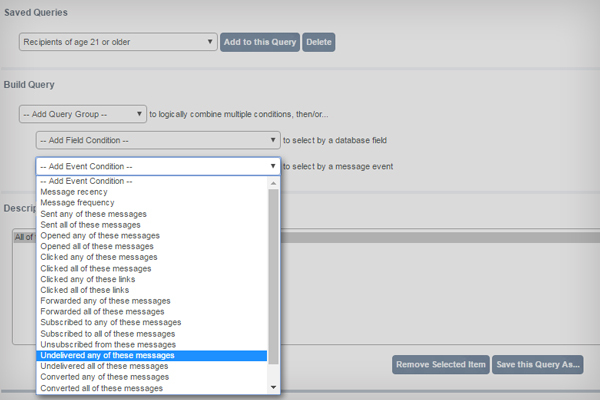 You can add fields to your database that quantify this information and set categories that you can target your messages to. Although you'll be sending to smaller audiences they'll be more likely click through your messages. By increasing your audience engaged with targeted messages, you will help your list's reputation and increase the chances of landing in the inbox. Even if you are unable to gather messaging preferences from your audience you can build your own database on which you can target your messages. Dig into the reporting tools to find out who and where your list is clicking and what sorts of messages they're clicking on. There are other targeting criteria you can choose in the Savicom Query Builder, including: engagers or non engagers to previous campaigns, members of a pre-designated sub-list, or any other combination of various parameters based on what's available in the database. After you have attempted to re-engage those who have not interacted with your messages, there will come a time when you'll need to remove these addresses from the database. Use the list management tools to select the list of addresses you want to unsubscribe from the database. If you don't feel comfortable unsubscribing them you can add them to a suppression list. This is a list of addresses that you choose to no longer send messages to, but unlike an unsubscribed address, these have a potential to receive future messages. Overall the main key is to keep an eye on your list's behavior. Look for trends in opens, clicks, and to see what interests your audience. If you see a spike in bounces, opt-outs, or drop in engagement, dig deeper into the report metrics to see where the problems are. Staying on top of these items and catching potential issues with your list early on can go a long way for the future health and reputation of your email program.